The Nurses for Africa team was touched by the community as much as it appreciated their visitHands at Work is privileged to see a number of teams step over our communities' thresholds every year. 2010 has been no different: This year alone Zambia has been blessed by two partner churches (Rock Church from Halifax, Canada and Grace Church from Racine, USA), and two Nurses for Africa teams with nurses from all over Illinois. Luanshya, also in Zambia, hosted a team from Perth, Australia. The Forge Church from Suffolk in the UK sent a building team and a team to run a kids camp in Luanshya, and Zion Christian Centre from West Midlands, UK sent a team to explore new communities in Kitwe and beyond with a view to setting up new partnerships. 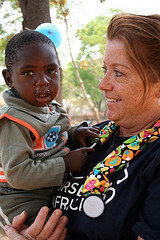 Click here to view pictures from the Australian and Nurses for Africa teams and a team from Saskatoon (Canada) on our Flickr page. Newer PostSave the dates, and start saving to travel!